Pharrell Williams is one of the most recognizable music producers of the past two decades. He’s had a sneaky long career that dates back to the early 1990’s, but he came to prominence in the early 2000’s as part of the production duo The Neptunes. They produced some of that era’s biggest hits including Jay Z’s “I Just Wanna Love U”, Britney Spears’ “I’m A Slave For You”, Nelly’s “Hot in Here”, Snoop Dogg’s “Drop It Like It’s Hot”, and many more. As a solo artist, Williams’ biggest hit is undoubtedly 2013’s “Happy”, which comes off the Despicable Me 2 Official Soundtrack. Dancing with a dog can always make you happy! This song is one of the catchiest songs of the past decade, possibly ever. It stayed at the top of the Billboard Hot 100 chart longer than any other song in 2014, and was considered Song of the Year by many critics. This is due to a combination of soul, Motown, and pop music that is as infectious as it is uplifting. Pharrell’s vocals are perfect for the smooth, uptempo beat, and the sparse composition allows those vocals to shine. The song has a funk groove that practically begs the listener to get up and dance, which is fitting considering the music video. You truly have to be happy listening to this because this combination of groove, vocals, and vibe can’t possibly leave you angry. 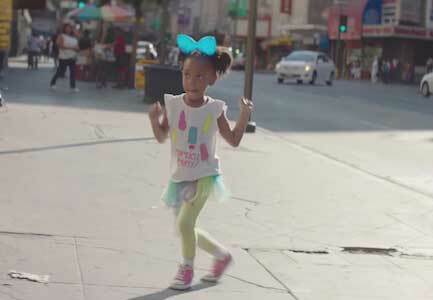 A little girl wears pink chucks as she dances in Hollywood. There’s no better tell that someone is happy than if they’re dancing like nobody's watching, and that is exactly what this music video proves as it features Pharrell, a gaggle of celebrities, and everyday joes dancing across Los Angeles. These dance scenes are actually an edited down version of a 24 hour livestream that was shot in 2013. To film this, the song was played on repeat for 24 hours as multiple people jumped in front of the camera to show off their moves. This gives the video a real sense of authenticity, and makes watching these total strangers dance so enjoyable. We see some of these everyday people are wearing chucks as they dance, which fits given the Southern California location. This video fits perfectly with the song, and creates a combination of utter joy that anyone watching will be left with a wide grin on their face. 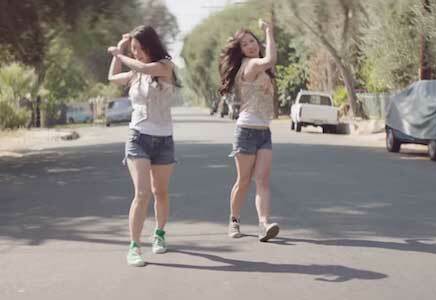 Two sisters wear green and black chucks while dancing in the street. Make yourself happy with a new pair of chucks by clicking on the links below.